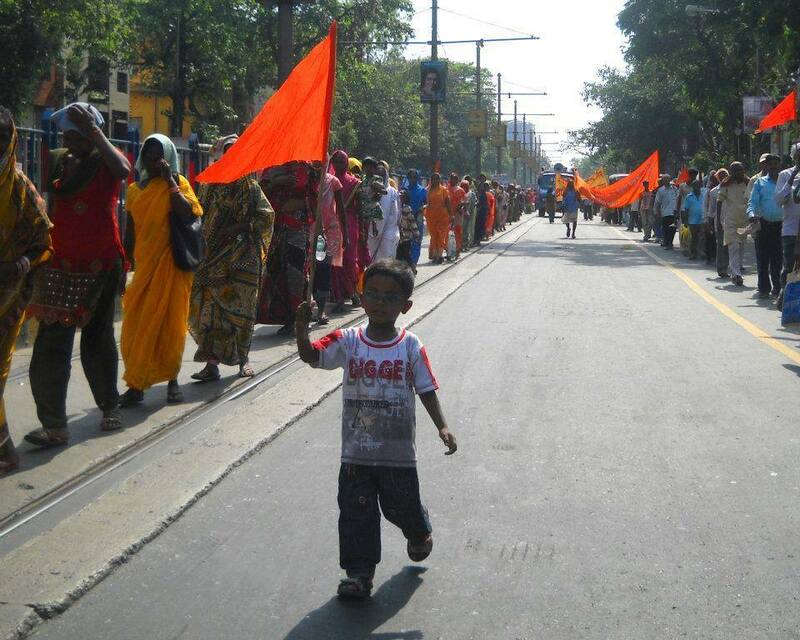 A boy joining the procession of Ananda Margiis and supporters in Kolkata on April 30, 2014. 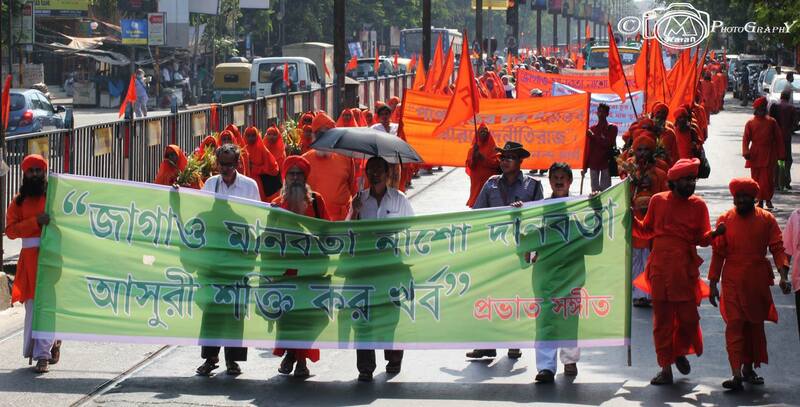 The Ananda Marga Pracaraka Samgha organisation took out a silent procession with thousands of its followers led by the members of civil society of Kolkata, who walked the one and a half kilometre distance from Deshapriya Park to Bijan Setu. After a short spiritual function at the murder scene, prominent members of civil society and Ananda Marga officials demanded that a judicial inquiry must be conducted by the Supreme Court Justice now that several attempts at establishing government inquiries have failed miserably. In 2011, 34 years of communist rule in West Bengal ended with the election victory of the Trinamool party. Since, communist forces have made their way into the new government. The two government inquiry commissions that have been established so far to investigate the Bijan Setu massacre have proven inefficient. Asst. Dist. Magistrate Sher Singh has offered that Prout was the reason for the cruel attack and murder of the 16 Ananda Marga monks and one nun in broad daylight in Kolkata in 1982. The Ananda Marga organisation supports PROUT throughout India and the world. The very essential way to make protest against those murderers is that there shall be a Non-Government Organization (NGO)with the participation of the Lawyers and private to sign a manifesto for justice of the massacred victims and bring justice to those who were killed by the communist group. Document all evidences and create a special monitoring body to document the moves of the influential government’s individual purposely to exposed their wrong doings. The apprehension of covering up the assailants is becoming more and more strong as the days are passing out silently. There is no discussion, no feed back from the media on this issue. The communist murders are still very happily and proudly moving in the city. But people indirectly punishing them very silently. The back bone of the communists in Bengal and in India has been broken in this general election. Another meaning of the word acala is dharma, righteousness. Dharma always remains established in its position, whereas human beings waver. Sometimes human beings go beyond the domain of dharma and bring great harm upon themselves and society due to misguided intellect, defective philosophies, evil company or faulty direction. Recently you may have noticed that Marxists sometimes shout at the top of their voices and cry themselves hoarse to proclaim that they do not accept dharma. They have now been caught in the trap of their defective philosophy, and their leaders have been caught in the same trap. They liquidated hundreds of thousands of simple, innocent people on flimsy charges without even the pretense of a trial. Was this a humanitarian act? This bestial genocide occurred because Marxists deviated from the path of dharma. Today such people deserve severe condemnation by humanity. It is a sin to waste public money to build huge monuments or construct roads in memory of these people. Until they capture political power in a country, these hypocrites repeat the sweet slogans of democracy like parrots merely for public consumption. But once they are in power, they unscrupulously throw democracy in the dustbin and grind subtle human sensibilities and higher human values to dust under the steamroller of a ruthless party dictatorship. Communism is unable to provide the proper environment for the creation of a strong, solid psychic and intellectual structure. That is why moral stamina – moral sanctity – is lost in communist countries. Such a phenomenon took place in India just before the Buddhist Age because of the influence of Cárvaka philosophy. Cárvaka philosophy was a protest against Vedic “bogusism”, although it was materialistic in nature. During that period there was not even a pinch of morality – society had lost all its moral stamina. Today the same thing is happening and will continue to happen in communist countries. In communist countries there is no sanctity in moral life – society is devoid of moral principles. In the name of this defective theory one of the leaders of the Soviet Union killed more than 500,000 people and sent many more to labour camps in Siberia. Among all the anti-human and homicidal theories that have been created in this world, communism is the most barbarous. The day has come for it to be thrown on the scrap heap forever.